Wayne Ficek put aside a round robin defeat as he led his Kenora team to a thrilling come from behind victory over Thunder Bay's Carl Levesque in the final of the MEDIchair Northern Ontario Provincial Championship at the Fort William Curling Club. Down 7-3 after 6 ends, the Kenoran's scored 5 in the 7th and 2 with the hammer in an extra end for a 10-8 win. Line score HERE. Ficek and 3rd Mark Wherrett played for Levesque at the 2008 Championship on a coach selected team. This year they will take Chester Draper (2nd) and Denise Miault (lead) to the Nationals in Nova Scotia March 23-28. 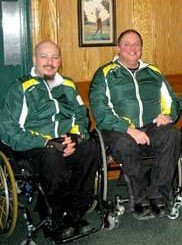 The Northern Ontario Championship was sponsored by MEDIchair who issued this press release about their involvement in wheelchair curling. I believe they beat Jim Armstrong last year. Look for good things from these guys. Yes they did - in Draw 3 they stole singles in the 5th and 6th ends to tie, and then stole 2 in the extra (7th) to win 6-4.